If you grew up in the '90s, there is no doubt you grew up loving the movie Titanic. And if you grew up loving the movie, you probably daydreamed about yourself actually being on the Titanic. Well, now you might just get your chance: A replica of the Titanic you can ride in real life is being built in Daying, China. The wait for the New Titanic, as it's called, is not expected to be too long, either; according to the Guardian, the target is for it to be ready by the end of 2017. There are few curious things about it, though. First, it's being built in a landlocked location about 750 miles away from any body of water, which means it won't ever actually set sail — and second, a simulated iceberg crash will allegedly be part of the experience for visitors, according to the New Titanic's website. If you're scratching your head right now, you're probably not the only one. First, though, perhaps we should go over some of the details: The New Titanic will have all the amenities the original was known for, including a ballroom, theater, and pool, which people on the ship will actually be able to use. A few adjustments have also been made to suit the modern visitor; WiFi and other contemporary amenities will also be available. The prices to board the ship, or what packages may be available, have not yet been released. According to Reuters, the project is part of the Star Energy Investment Group's plan to build a tourist resort based around the Qijiang River. Now, I love Titanic as much as the next person, but some details about this new replica do raise some serious questions. While more information on this aspect of the ship has yet to be released, the "hit the iceberg experience," as the New Titanic's website puts it (via Google Translate), is... a little odd sounding at first. I mean, I know that many of us have fantasized at least once about what living in the lap luxury at the turn of the century was like — but let's not forget that the Titanic was a real life disaster that killed over 1,500 people. Hopefully the simulation will be educational, because if this part of the experience comes across more as a theme park ride, it definitely has the potential to read as insensitive. Curtis Schnell, a Hollywood production designer and producer who is part of the New Titanic team, said to Reuters that the iceberg experience is being handled in a "very respectful way"; still, though, while it's important to keep history alive, so to speak — which the "hit the iceberg experience" could do in a very real way — I also think there's a line between honoring history and turning it into an amusement park attraction. Here's hoping the New Titanic's iceberg experience is the former, rather than the latter. It's worth considering that this isn't actually the first replica of the Titanic that we've heard about. 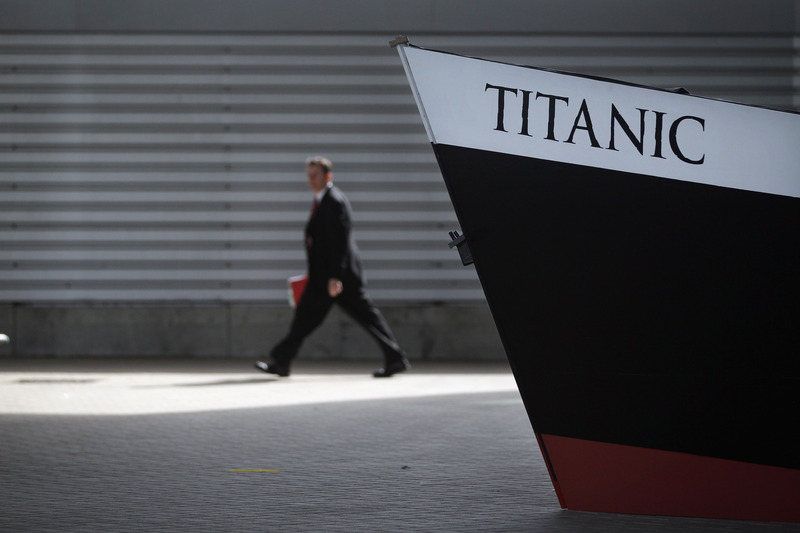 For example, the Titanic II is being called an actual replica of the Titanic; it will set sail for real in 2018. This replica also goes all the way in its efforts to recreate the original, including separating passengers by class (which, in my personal opinion, also raises some questions). However, as this is an actual ship that takes passengers on sea, it's decidedly not the same appeal as The New Titanic. Personally, I think there is a lot to unpack when it comes to all of these replicas. While there is a lot of glamour and excitement when we think back on history — especially once an event is made into a blockbuster film, like Titanic — it's important that we don't become too nostalgic and try to blur out the actual tragedies that happened. It's also important to keep our eyes open to oppression and transgressions in the past and not wear rose-colored glasses, even when it's something we generally like or enjoy learning about. All of this said, I'm excited to learn more about what specifically the New Titanic has to offer. You can follow its construction process on Twitter at @New_Titanic.